"It promises to be the strongest grout cleaner you can buy online." "It attacks grease, oil, and soap deposits with a vengeance." "Kill germs on everything from your kitchen countertops to your shower and toilet.​"
"Customers say it works better than expected and it whitens in minutes." "While it sounds too good to be true, you really don’t have to do any scrubbing." "Cut through all the crud in your grout and beyond." "It can be used in hard-to-reach spots such as shower door tracks and stovetops." "No residue is left behind, just grout that looks cleaner and brighter." When it comes to grout cleaners, this one from The Floor Guys gets top marks all around. Its name says it all: Grout-Eez. This professional-strength formula is about as easy to use as it gets—just spray it on, wait 10 minutes, then wipe away whatever dirt and grime is lurking in your grout. Grout-Eez is safe for both ceramic and porcelain tile and the only change it will make to the color of your grout is to bring it back to its original color (remember that one?). It promises to be the strongest grout cleaner you can buy online, and customers testify that it works quickly and effectively. A glance at their impressive before-and-after comparison photos makes a convincing argument to give this grout cleaner a try. Grout stains, beware. From Black Diamond, this grout cleaner promises to clean even the grimiest grout, and customers say it delivers on that promise. It attacks grease, oil and soap deposits with a vengeance. The acid-free formula is safe for ceramic, marble, and porcelain tiles. To use, you spray it on, wait for one to three minutes, then use a brush to loosen and rinse it off. It can also be used with a grout steam cleaner for extra cleaning power. While it’s not designed to remove mold or calcium deposits (you’ll need a separate cleaner for those), many customers say for basic grout stains it’s the best. While it may take a bit of elbow grease to get the product’s full benefit, most agree the results are worth it. It’s non-abrasive, so it’s safe for most surfaces, but it’s tough enough to get out tough stains like coffee. To use, you apply, rub and rinse, letting it sit longer for tougher stains. Customers swear by it, saying it leaves grout and other surfaces looking like new. For white grout that isn’t so white anymore, there’s this formula from Zep. A grout cleaner and whitener in one, it promises to have your grout as white as white can be in just minutes, with little to no scrubbing required. It’s not safe for all surfaces—not recommended for marble, stone, metal or Corian—but it is bleach-free, so you don’t have to worry about it discoloring colored grout. Customers say it works better than expected, doesn’t have an overpowering scent, and that it’s a bargain for the price. One reviewer on Homedepot.com went so far as to say they think it’s underpriced, it works so well. When it comes to shower grout, you need something tough enough to take on stubborn mold and mildew, like this spray from Home Armor. The bleach-based formula promises to kill them instantly, with no scrubbing required (seriously, no scrubbing), and keeps them from coming back for up to two months. Beyond the grout, you can use it for all your other bathroom cleaning needs, including the shower curtain, toilet and beyond. Customers are wowed by this product, saying it melts away shower mold, and while it sounds too good to be true, you really don’t have to do any scrubbing. Reviewers call it “amazing,” “magical” and “the best product ever.” Some say the fumes are fairly strong though, so be sure to take precautions when using it. With its no-nonsense name, Krud Kutter is designed to cut through all the crud in your grout and beyond. 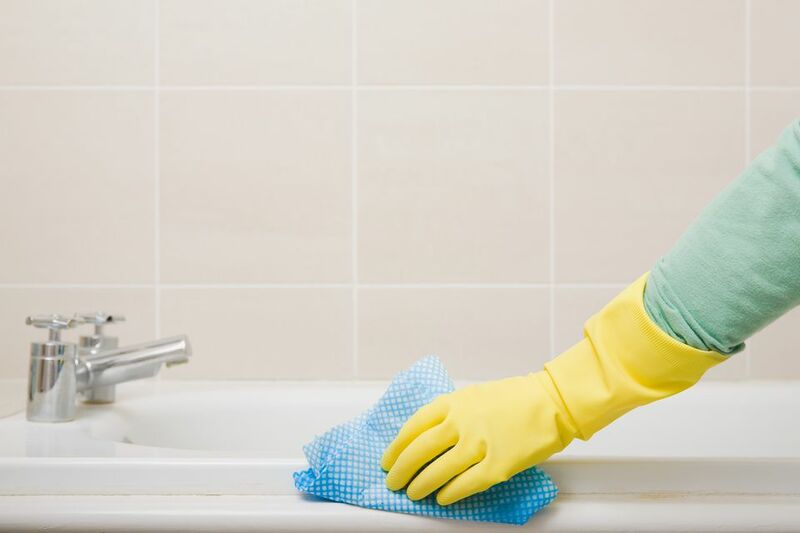 While it works on almost any surface, including denim, driveways and even engines, it works especially well on the tile found in kitchens because it contains a degreaser. For tile and grout, it's recommended you use the product at full strength, but it should be diluted for use on other surfaces. To use, you spray it on and wipe off, no rinsing required. Customers are crazy for this product and are blown away by the results they get in various areas of their home. They also note that it doesn’t have the strong chemical odor of other tough cleaners and like that it’s made from non-toxic ingredients. This stain-fighting pen from Clorox was designed specifically for grout and other tight spaces and crevices. It comes with a built-in brush, which makes cleaning quick and easy. Just squeeze the gel out, use the brush to scrub, then rinse clean. Though we often think of bleach when we think of Clorox, this formula is bleach-free, so it’s safe to use on a variety of surfaces, but still tough enough to remove things like hard-water stains and soap scum. Beyond grout, it can be used in other hard-to-reach spots, such as shower door tracks and stovetops—basically, all your cleaning pain points. If you’re looking for some extra-cleaning power, Clorox almost makes a version of this product with bleach. With the pitter patter of little feet, big feet and those of pets, floor grout can be some of the grimiest in the house. That means you want something tough, but also safe, because, of course, all those feet are precious. TECH grout is 100 percent odorless and 100 percent biodegradable, yet it promises to get out your toughest grout stains. To use, you spray it on, scrub with the included brush, then rinse or mop. No residue is left behind, just grout that looks cleaner and brighter. Customers say that while it may take a bit of elbow grease to scrub out the stains, the results are worth it.